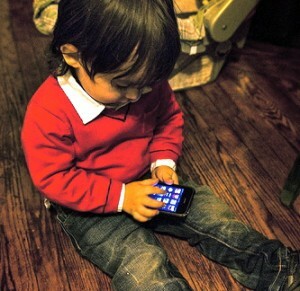 I have a confession to make: my 19-month-old son, Paul, is allowed to use my iPhone. In fact, he’s pretty savvy with touch screens. He can turn the phone on, unlock the list of applications, choose the program he wants to experience, and interact with the content. Although he was a loyal Duck, Duck, Moose man when he was a baby, now that he is a toddler his current favorite app is Balloonimals. To interact with this beautifully produced app, the user first blows on the iPhone microphone to inflate the virtual balloon, then shakes the device to turn the rubbery image into a rotund animal. Paul is an expert at these simple steps and he loves using his pudgy little baby fingers to manipulate the fully constructed balloon creations. He can go from limp balloon to full-fledged unicorn in less than a minute. Yes, I fall decidedly on the iPhone side of the toddler-tech divide. However, I am not trying to assuage my guilt by convincing myself that Paul is actually building mind-muscles when tapping around on the glowing screen. In our house, the iPhone is a sometimes toy, and it usually lives out of sight, buried deep in the recesses of Mommy’s purse. It sometimes appears in emergencies like long plane trips and restaurants with slow service, but it is not a staple of my toddler’s playtime. He spends car rides watching mountains, goats, cyclists, and big trucks roll by his window, not watching a screen. When we do use the iPhone it’s typically done together. We go through flashcards and talk about the different animals, colors and foods we see. We read illustrated e-books out loud and he shows me pictures of grandma and the cats. I’m increasingly frustrated by arguments that refer to kids and technology as an all or nothing phenomenon. Information technology, particularly more modern forms of communication technology tools, can be used in ways that encourage social interactions rather than detract from them. Isn’t it time we move away from the image of a techno-geek as some kind of socially inept shut-in? I hope to raise my son to embrace technology rather than fear it, and I believe that strategic use of advanced technology at a young age can be accomplished without sacrificing interpersonal interactions.